On this last day of the copyright consulation, I have been amazed by the number of people who have written recently with news of their submission posted on a blog or other site (examples here, here, here, here, here, here, and here). The government reports that they have received over 5,000 submissions, but it is clear that number is going be higher by the end of the day. One of my favourite submissions comes from Wallace McLean, who focuses on public domain, archival, and photography issues. While the submission is not yet online, he was kind enough to grant permission to post the charts below. 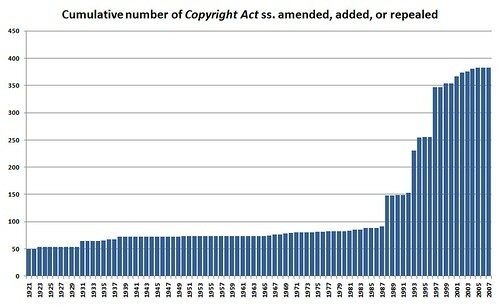 The first tracks the cumulative number sections of the Copyright Act that have been amended, added or repealed. 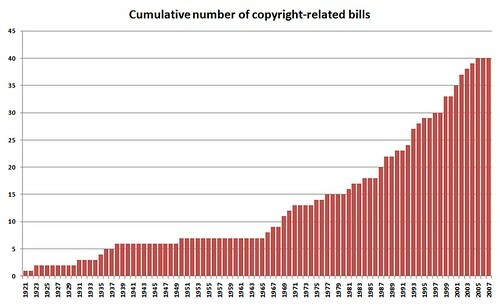 The second shows the cumulative number of copyright bills that have been introduced in Canada. I think both charts speak for themselves – far from being an archaic law that never changes, copyright law in Canada has undergone considerable change, with the most dramatic reforms occurring over the past two decades. The end of the consultation signals that these charts will continue to grow in the coming months, making it more important than ever to ensure that you speak out on copyright today (literally today).